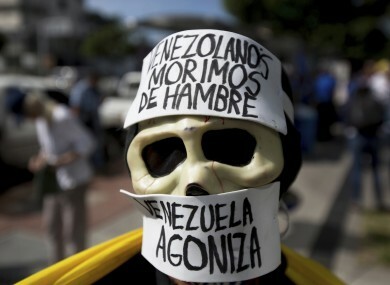 A demonstrator wears a skull mask with messages that read in Spanish: "Venezuelans die of hunger, Venezuela agonizes" during a protest in Caracas in January. THE RUBBISH BIN truck brakes and desperate teen Rebeca Leon runs up to root hungrily through the bin bags. “My mom is putting weight back on now because I have been searching for food like this,” she says. Rebeca has been doing it for six months as inflation and shortages have worsened. When the school day finishes, she heads to Caracas’s posher districts to pick up what richer citizens have thrown away. And 1.5 million are living on food given to them or found in bins, says one of the report’s authors, nutritionist Maritza Landaeta. Nearly 52% of the population lives in extreme poverty, says the study by a group of universities. Seven out of 10 people in the country have lost weight — 8.7 kilograms on average. “I used to cry because I felt humiliated. But I don’t care about that any more,” she says. If you don’t have a job, and you don’t look in the bins, then you don’t eat. “One night, we had to go to bed without eating. I wouldn’t wish that on anyone. The children were crying: ‘I’m hungry,” he says. I sold my tools and everything, and in the end I came out searching in the streets. There are thousands of us living off garbage. Supermarkets sell rations of food and household supplies. But even at state-subsidised prices they are unaffordable for many. The International Monetary Fund estimates that inflation will reach 1,660% this year. His government has been targeting bags of subsidised goods at poor areas. He says the that will help millions of households this year. “Sometimes you do, and sometimes you don’t — at least not today. Today it went badly,” she says. There she will study alongside schoolmates who sometimes “faint from hunger,” she says. Email “National food shortage sends thousands of starving Venezuelans to root through bins ”. Feedback on “National food shortage sends thousands of starving Venezuelans to root through bins ”.